Pesticides are usually poisonous, sometimes flammable or even extremely flammable liquids and can easily cause pollution. That is why national and European regulations (e.g. EurepGAP, Cross Compliance ...) have been set up to protect the ground water and the environment. In order to comply with the legislation and also to protect efficiently our environment, some fundamental rules have to be applied. Pesticides must be stored at a reasonable distance from water points, fragile crop, house lots, food (cattle food, vegetables), electrical wires .... .
A Storage area can be either a bungalow, a container, a dedicated protected room or a safety cabinet. These storage areas or safety cabinets must be ventilated (technical or natural ventilation) and lockable. Furthermore, the doors of the cabinet have to open towards the front and they have to be absolutely leak proof (e.g. equipped with a base trough, or a retention tank). 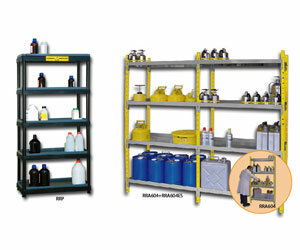 The safety cabinets must be unequivocally labeled, clearly marked with the stored product propriety with a normalized pictogram (according to ISO 3864 and the European Guideline 92/58/EEC). In addition, the pictogram should include relevant information (e.g. first-aid recommendations, emergency telephone numbers, indication “open fire prohibited”). First-aid equipment must be in reach ready to be used. Pesticides must not leak from containers or from storage premises. A pesticide cabinet or sump must be equipped with a 100% leak-proof retention tank. It is strictly forbidden to equip a retention tank or sump with a faucet or any other opening device. Also, note that retention tanks should never be used for storage, unless you equip them with a perforated duckboard shelf. Note: in this case, you may use the duckboard shelf as an additional storage shelf. The retention tank must be adapted to the substances to be stored (media resistancy), avoiding alteration of the tank and causing possible leakage within time . The cabinet (or container) must be ventilated (10-fold change of air per hour). The retention tank or sump must contain 50% of the stored liquids, and / or at least the content of the largest container (whatever is greater). In protected areas (if storage is permitted! 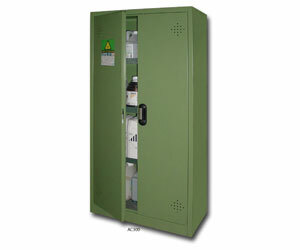 ), 100% of the stored chemicals must be retained in a retention device. Pesticides should be stored in their original container – or marked with all necessary details (e.g. Product name, product specifications, warning signs, S- or R-phrases …). It is very important to store the chemicals separately (by product families: e.g. flammables, hazardous liquids, acids, bases, etc.) avoiding reactions which could cause accidents. The empty containers of very poisonous products should be recycled according to national and local waste disposal regulations.